Do you remember that reassuring, cuddly blankie that you had as a child? You know the one. . . the one your mother had to keep mending or worse (if she lacked sewing skills) stapled together because you wouldn’t part with the tattered textile? The one you wouldn’t leave the house without? I would like to lobby for the return of the blankie for us (slightly!) beyond baby stage. Seriously, what Spa Home would be complete without objects that coddle & soothe or just make us plain happy? 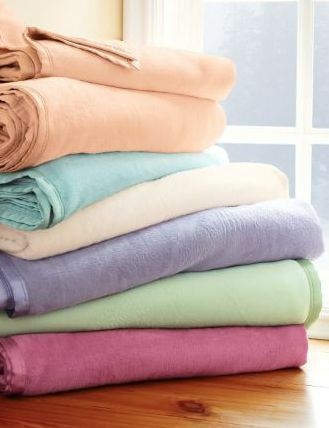 And scrumptious linens are a budget friendly way to do just that. So I don’t like to think I’m regressing as I grow older. . . but my blankie’s back & I’m never going to relinquish it! Seriously, when I found the Perfection Sleeping Throw from Soft Surroundings – I was simply looking for something to keep me warm in my cold drafty Victorian house. Honest – that was it – a little warmth – a perfectly respectable goal. And warm it was. . . and let’s not forget snuggly, supersuedy and featherlight. But before you knew it, I began to crave it’s buttery bunny eared softness when I worked in my home office, as I fell asleep, in my meditation nook and during long road trips. Though he made fun of me for buying the throw, my boyfriend soon shanghaied it every chance he got so I had to buy another. And did I forget to mention that my cat, Miro, made it into a new cozy bed? Ya know what they say, if you want the most comfortable spot in the house you have to move the cat! Proof that the Perfection Sleeping Throw is the comfiest blankie on earth. Buy it at Soft Surroundings .